The new museum, which will open on 17 March 2016, focuses on contemporary outsider art from the growing Dolhuys collection: hundreds of works by scores of artists from Britain, France, Iran, Japan, and Holland. ’Outsider art’ refers to art made by people who did not study at art academies. This movement attracted widespread interest after the First World War. The psychiatrist Hans Prinzhorn (1886-1933) published the book Bildnerei der Geisteskranken, illustrated with a wide range of art works by patients in psychiatric institutions. This book inspired many artists, such as Salvador Dalí, Karel Appel, and Asger Jorn. Jean Dubuffet (1901-1985) later came up with the term art brut, meaning ‘raw art’. In 1972, the British art historian Roger Cardinal coined the phrase ‘outsider art’. The Venice Biennale of 2013 launched outsider art into the international art scene. Among these artists, one famous name is Shinichi Sawada (b. 1982). He exhibited at the Venice Biennale in 2013, when outsider art took the spotlight there. That event launched this emerging movement into the international art scene. Sawada makes ceramic sculptures in an intensely perfectionistic process. Hans Looijen, director of the Dolhuys, is the responsible for the artistic and business management of the new Outsider Art Museum. He says, ‘For the first time, this unique form of art will hold a permanent place in a leading Dutch art institution. This is a tremendous opportunity for us to present talented new artists to a broad public.’ For ten years, the Dolhuys has successfully run its ‘museum of the psyche’ in Haarlem, where visitors discover surprising dimensions of the human mind and spirit. Now it brings its expertise and experience in collecting and exhibiting outsider art to the Hermitage Amsterdam. Cordaan hopes that its role as a partner in the new Outsider Art Museum will attract new recognition for talented artists with disabilities. The studios will soon host a special programme that forms the seed of a ‘national academy’ of outsider art. ‘Several Cordaan clients have shown exceptional drive and ability. Their work will soon hang in the Hermitage alongside that of other outsider artists. We’re delighted, of course. 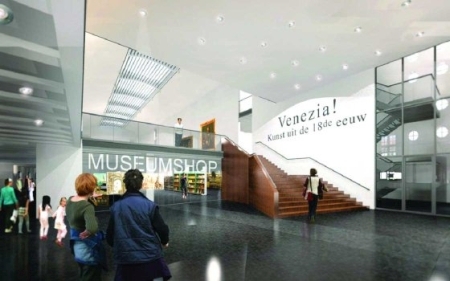 The new museum means recognition, appreciation, and understanding of people with disabilities,’ says Eelco Damen, chairman of the Cordaan executive board.